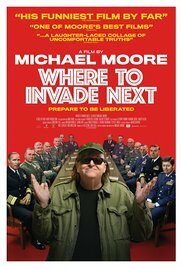 Michael Moore's latest documentary, Where to Invade Next, has a very similar format and slant to Sicko. Instead of contrasting medical aid schemes and healthcare policy with other first world countries, he's decided to rather stake a claim over other countries great ideas. Using an American flag, he travels Europe and Northern Africa planting it once he's established that the idea could be feasible for America. France, Germany, Finland, Norway, Italy, Portugal, Iceland and Tunisia are his hunting grounds, where he investigates law, prison, gender politics, education and healthcare systems. Each investigation first explores what the big idea is through charts and interviews with insiders and then contrasts with United States, using a critical yet humorous tone, typical of Michael Moore. Moore's documentaries usually are quite one-sided and Where to Invade Next is no different, delivering a perspective that he refers to as "picking the flowers, not the weeds". Being quite open about his method makes it easier to roll with his "worldwide" scramble for great ideas. While it has a similar format to Sicko, the tone is much more constructive, funny and optimistic. Instead of berating the United States and criticising it to the point of being labelled anti-American, he has chosen a much more relatable stance. The attitude behind Where to Invade Next feels more like a brainstorming session on a whiteboard than a direct attack. Just like Donald Trump's "let's make America great again" campaign slogan, Moore is concerned with proffering hope rather than simply poking fun. The collection of ideas demonstrate that these systems are currently in operation and seem to be working effectively based on the evidence. These are fairly broad brush strokes, not really taking into account any of the sub factors, but providing enough thought-provoking sentiment to spark the right conversations. His documentary does get quite provocative that times, touching on the Norwegian prison system in the wake of the 2011 massacre and unfurling his conspiracy behind the "War on Drugs' in the United States under Nixon. Moore adopts a fairly casual approach to his interviews and has a good-natured sense of humour, not afraid to self-deprecate or applaud/tease his interviewees. He's not quite as funny as Ali G, but manages to keep things fairly grounded and easy-going. The incredulous tone, the eye-opening ideas in action and the express tour keep things upbeat and fairly brisk, however as a documentary it runs a bit long at two hours. The format's trademark Michael Moore style makes it more of the same for his fans and even while he has to use a makeshift pole for each flag planting to keep the concept alive, it works. While not quite as shocking or accusatory as Sicko, Where to Invade Next makes a delightful follow-up, which picks up on the healthcare niche and broadens it to explore other key governmental departments. It's more accessible, simply because he's not just pointing (or flipping) the finger, but asking the right questions. It's a much more positive angle, and while it doesn't have the same snarky vibe as his previous films, it's hugely entertaining and will have audiences from just about every country wondering why their government doesn't take a page too.